Well, I’m a mommy of twins, age 5. If you ask me how have the past five years have been, I would describe it as lots of tears, followed by lots of happiness- of the real kind. Indeed, from the moment my ultrasound test told me I was carrying not one, but two babies, I felt incredibly blessed. There’s no denying that. Well, to each her own, but back to my story! Agreed, the first six months were tough, real tough. Waking every two hours to breastfeed (later bottle-feed) two very hungry babies is nothing short of a Herculean task! Especially, if you don’t have the help of an “ayah” as in my case, because I was at my mother’s place in monsoon-time Kerala. Gosh, I can never forget those dark rainy nights and days, attending to my newborns’ needs, literally on my own! Those thousands of cloth nappies (because I chose not to go with diapers in the initial months when babies poop as much as they pee) I had change, wash and dry (and throw), while maintaining my inner Hygiene Nazi’s high standards! On the hindsight, I must have washed millions of nappies, not just thousands. The weight loss as a result of breastfeeding was a silver lining to the dark (monsoon) clouds in my life but when nursing ended, came hunger pangs, the likes of which I never experienced before. Despite my mother (Mothers! Sometimes, you have to wonder if mothers are any better than mothers-in-laws!) warning me to “watch it” , there was no way I could stay away from those fatty foods. Of course, I put it all back, leading to greater depression. There was no way I could work out either, after attending to my babies’ needs. Then came the five-month milestone. Now, the worst seemed behind me, and the “cry babies” were now angelic and smiling and gifting me the best photo-ops ever! In fact, I wish I could have enjoyed those days better. They were at their cuddliest and cutest, as every mommy would agree. From five months to five years, the journey has had its ups and downs, but worth every bit of it. For instance, when I went for school admissions, I was told the school owner had twins, so my entry was guaranteed. But the downside was that my twins would be in different classes. Then, birthday parties! I go to birthday parties for one, with two in tow, raising some eyebrows. Well, they asked for it! Sometimes, I even warn them I’m coming with two (and two means two return gifts even if they bring just one gift between themselves). I must confess I have not been invited a second time in some cases. But I take it philosophically! When it comes to playtime, twins means both wanting to do the same thing at the same time, and bringing down the roof to get what they want. But it also means they have each other to play with, and I don’t have to find a friend for them in today’s largely anti-social world. Finally, when I go to buy clothes, I try to make sure I choose different colours and styles, because I DO NOT want to be asked for the nth time, “Are they twins?” Oh, did I mention, they are not identical? Hi radhika. So good to read all yr comments. I am too a mother of twin both boys 6 yrs. I can really understand n relate to all as we all have been enjoying n going through same condition of bringing them up. Hey i m also a mother of twins ,they r twin girls born on the 1st of jan 2016 they are 2 months old as of now its very difficult to handle twins plzz can anyone help me with breastfeeding issues my children dont take my milk I bottlefeed them they r so used to it they get so restless and start crying like mad wen i breastfeed them there is a guilt inside me that i cant breastfeed them plzz can anyone help!!! HI.. LOVELY TO READ YOUR STORY. I have non-identical twins now 3 year boys,in addition to a 7 year old elder one!!. i am a doctor and i started working full time only after they started play-school. but its all worth it.. if u have laid a strong foundation,rest assured they will be fine the rest of their lives.. happy parenting radhika! hiii!!! even i m mother of twins daughter they r 13 mnths now n yes they r identical.... can so much relate to ur post n had face few starting months like u without maid can imagine... hats off to all mothers of twins!! three cheers for the twin mommies!!!!!! Hi radhika, i am also a mother of twins (two boys and again non-identical) of 3yrs and 10 months. i could relate your herculean task with mine but my case was little differnt. i am at my mom's place till now as my husband stays away because of his higher studies and i am also doing Ph. D. so all the day time i have to be in the research lab. My parents and my Maternal uncle and aunty and my cousins are so good to handle them that i feel blessed to have all of them around me. hats off to them. my kids are studying at nursery pre-KG, but they are not attentive for studies. they do their all the works and plays well with double concentration but not studying. can you help me or give me some suggestion how to make them studying together? i feel hard to make them study. Hello, Radhikha. Even I have twins ( not boys but in my case girls & yes, again non identical ) . They are 4 months now. But, unlike you have a helping hand ( god knows what would I do without her ) . But, seriously, hats off to you to manage both the kiddos on your own. Great going . Good blog ! Hattsoff to the mother of twins.. Though compared to u all my journey is too short but the problems are more or less same in my case too.. As my twin boys are 7 months old and they are preterm babies.. And bfr that I am a mother to a baby girl of age 5yrs. Omg I don't know how I managed these 7 months... As babies were preterm more care, more attention, more crying,everything more but less of sleep.. Even though I have got a helping hand in day time... My nights r like nightmares. I handle them alone at nights.. There were days where I cried... Screamed.. But since 3 weeks I am finding lot of difference in there sleeping pattern.. Finally got a couple of hours to sleep... Looks like my worst day have passed away.. Smiles on there faces make me forget everything... And yes they r Identical Twins. 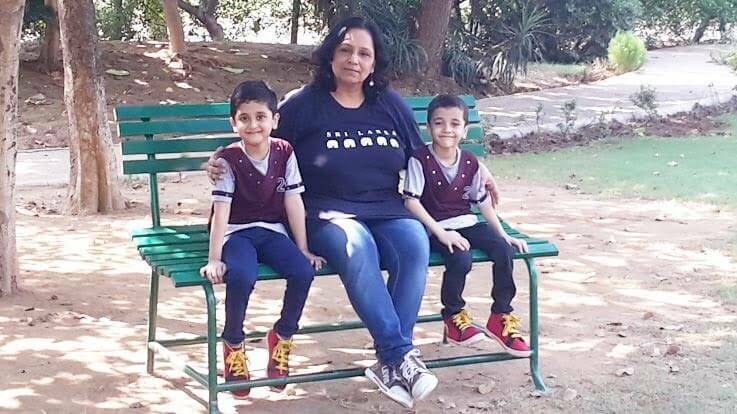 a Hi Radhika nice article,yes i myself mother of twins(5yrs) nw,we have our own positive and negative side in upbringing twins likehealthissues when they both fall sick,school admissions as u say,financial criteria etc,the most irritating thing i feel is when mothers of kids with different age groups say "oh you have twins,u did complete your family at one shot"they dont realise the pressure in bringing up kids,our health issues and other problems we face,each has its own sides. While reading your blog, I was remembering mine early years. Yes, I am mom of twins. Now my sons are 7 year old. When you talked about school admissions, I faced similar problems. With much discussions to school teacher to principal, I made them in one class. Now I do not work for my kids except food. :) They do themselves everything. I faced only one problem of their fight for one toy/thing. But it happens with other siblings too. Nice blog.